Everest Base Camp tour, needless to say, is an indispensable of a Tibet tour for tens of thousands of tourists travelling to Tibet. It ‘s about 700 km from Lhasa to the world's highest mountain, Mt. Everest with an elevation of 8,848 meters. It seems to be a long journey, but it is not boring at all for you will be accompanied by beautiful landscapes and famous temples all the way, such as the beautiful Yamdrok Lake that is one of the three holy lakes in Tibet and just like an emerald on the plateau, the Karuola Glaciers lying on the roadside, just before your eyes, the Pelkor Chode Monastery with unique style taking in several factions of Tibetan Buddhism, the famed Tashilhunpo known as the Panchen Lama's seat, the Sakya Monastery reputed as the "Second Dunhuang" for its magic murals, and the world's highest monastery, 5,000 meters Rongbuk Monastery. Of course, the Himalayas stretching thousands of miles will never be kicked out of your Everest Base Camp tour. Day 01: Arrival To Tsedang from Beijing/Shanghai/Chengdu/Xi’An/Xining/Kathmandu. Day 02: Tsedang Sightseeing of Yumbulakhang, Tandruk Monastery and Tibetan King’s Tomb. Day 03: Drive to Lhasa enroute sightseeing of Samye Monastery. Day 06: Drive To Gyantse via Yamdrok Lake. Day 08: Drive To Xegar Via Sakya Monastery. Day 10: Excursion around everest Region and same day drive to Kerung. Day 11: Drive To Boarder, cross border to Nepal. On arrival you will be received by our representative and will be trasferred to Tsedang. 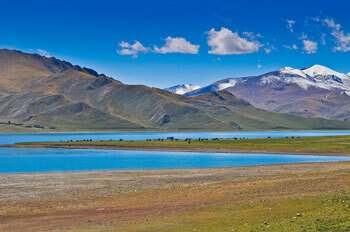 Enroute you will have beautiful sceneries of Tibet as appetizer. On arrival to Tsedang you will be excorted to Hotel as reserved. Overnight in Tsedang. Tandruk Monastery: Not very far from Yumbulakhang, Tandrk Monastery is situated at the road side. Tran means roc and druk means dragon in Tibetan. The monastery got is name from the legend that it could only be built after Songtsan Gampo had turned into a roc and conquered an evil dragon. It’s said that renowned figures in the history of Tibetan Buddhism, such as Padmasambhava and Milaripa, had practised Buddhism nearby after it was built and the remaining relics are Sacred land for the devotees. Trandruk was built during the reign of Songtsan Gampo, and later extensions were designed by Juequjian of it. It’s said Princess Wencheng stayed and practised Buddhism here at one time and left some relics. Trandruk later converted to Gelugpa and experienced large-scale reconstruction and later it belonged to Gelupa (one of the Sects of Tibetan Buddhism). Overnight in Tsedang. Tibetan King’s Tomb: A tomb near the north bank of Chonggye River is said to be the tomb of Songtsen Gamp, who set up the first unified regime in Tibet. This splendid tomb stands 13.4 meters (about 44 feet) high. On the top, there is a temple for worship in which the statues of Sonftsen Gamp, his wives - Princess Wen Cheng and Princess Chi Zu - and his ministers are displayed. The gate of the tomb opens to the west, the direction of Sakyamuni's homeland, demonstrating the king's piety to Buddhism. Today after breakfast, you will return back to Lhasa, enroute you will be doing sightseeing of Samye Monastery. Sera Monastery: Sera was founded in 1419, by Jamchen Chojey (Sakya Yeshe), a disciple of Tsong Khapa.Like the Drepung and Ganden monasteries, it had several colleges: Sera Mey Dratsang, built in 1419, gave basic instruction to the monks. Sera Jey Dratsang, built in 1435, was the largest, and was reserved for wandering monks, especially Mongol monks. Ngagpa Dratsang, built in 1559, was a school for the teaching of the Gelukpa tantras.Young monks printing scriptures. Sera housed more than 5,000 monks in 1959. Although badly damaged following the invasion of Tibet and the Cultural Revolution, it is still standing and has been largely repaired. In 2008, it housed 550 Buddhist monks, but the number dropped to only a handful after the 2008 Tibetan unrest.After the Chinese invasion of Tibet and the destruction of the majority of the monasteries in Tibet, Sera monastery was re-formed in Bylakuppe, India, near Mysore.Because none of the monks of the Ngagpa Dratsang (Tantric College) survived the invasion, only the Sera Mey College and Sera Jey College were re-formed in India. Norbulinka Monastery: The park was begun by the 7th Dalai Lama beginning in 1755. The Norbulingka Park and Summer Palace were completed in 1783 under Jampel Gyatso, the Eight Dalai Lama, on the outskirts of Lhasa. and became the summer residence during the reign of the Eighth Dalai Lama.The stables of the Dalai Lamas in Norbulingka, photographed in 1986.The earliest building is the Kelsang Potang Palace built by the Seventh Dalai Lama which is "a beautiful example of Yellow Hat architecture. Its fully restored throne room is also of interest." The 'New Palace' was begun in 1954 by the present Dalai Lama and completed in 1956. It contains chapels, gardens, fountains and pools. The gardens are a favourite picnic spot and provides a beautiful venue for theatre, dancing and festivals, particularly the Sho Dun or 'Yoghurt Festival', at the beginning of August, with families camping in the grounds for days surrounded by colourful makeshift windbreaks of rugs and scarves and enjoying the height of summer weather.The palace is located three kilometers west of the Potala Palace which was the winter palace. Additional buildings were added to the park during the first half of the 20th century. There is also a zoo at Norbulingka, originally to keep the animals which were given to the Dalai Lamas. Overnight in Lhasa. Today after breakfast you will leave for Gyantse. Enroute you will enjoy the beautiful Scorpion shaped Yamdrok Lake. You will have you best picture shot of Yamdrok lake at the higest alivation enroute to Gyantse, Kampa La above below 4800meters. Tashlunpo Monastery: Tashilunpo Monastery was founded in 1447 and is the largest Yellow Hat sect monastery in Tibet. Shigaste is Tibets 2nd most important city and Tashilunpo was the seat of the Panchen Lamas. Tashilunpo contains chortens, temples and the Panchen Lama?s palace. At its peak, Tashilunpo had more than 4,000 monks in its 4 monasteries. Upon the death of a Panchen Lama, it was the 4 abbots of these monasteries that would lead the search for his infant reincarnation.The monastery is a striking red, white and black Tibetan structure with a golden roof. Within the monastery there is a 5 story temple, which contains a 26 meters (86ft) sitting statue of the Maitreya Buddha. The statue was cast from 6,700 ounces of gold and over 115,000 kg of copper, making it the biggest copper Buddhist statue in the world. The massive Thangka wall at Tashilunpo can be clearly seen from most points in Shigaste. The wall is used for displaying enormous Thangkas - religious painted banners - for only a few festival days each year. After sightseeing you will drive to Xegar. Today you will do normal sightseeing around the Everest Region. On the same day you will trace your way to Kerung. Kerung is small town near Tibet/Nepal Baorder. Overnight in Guesthouse. At the Boarder, see off Tibetan Guide and driver and continue to Kathmandu with the Nepali counterpart. We stay in a deluxe hotel in Kathmandu that we deserve after traveling in rugged Tibetan terrain with limited facilities.